For those who can't eat wheat, quinoa (pronounced keen-wah) is a great alternative to pasta and couscous. Even if you can eat wheat, a side dish or salad made with quinoa makes a nice change. Quinoa provides all eight essential amino acids, which makes it a complete protein, making it popular with vegetarians. It's also a good source of iron, fiber and B vitamins. Despite its status as a super grain, quinoa is technically a seed. Quinoa is easy to prepare: rinse it before cooking to rid it of its bitter coating, then cook one part quinoa to two parts liquid for 10-15 minutes, until all the liquid has been absorbed. 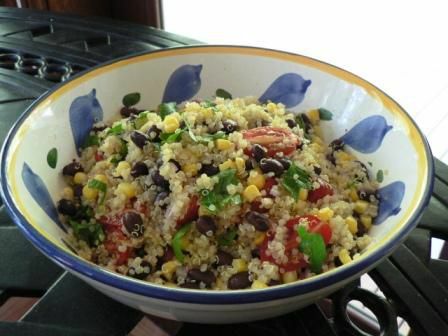 This colorful southwestern quinoa salad makes a wonderful side dish for grilled lean pork or chicken. It also works as a lunch salad all by itself. Chickpeas, or garbanzo beans, add extra fiber to this nutritious zucchini quinoa salad. Again, this salad can stand alone as a main dish or act as a side dish for lean grilled meat or fish. Here's a great low fat vegetarian main dish. Bell peppers are stuffed with quinoa, cremini mushrooms, onions, garlic, spinach, and parsley. It's a truly delicious, nutritious and satisfying entree. Grape tomatoes, hearts of palm and cubes of part-skim mozzarella round out this tasty quinoa salad. If you don't have hearts of palm, try canned or jarred artichokes. Feel free to add some roasted red peppers, too. Lemon cilantro quinoa is more of a pilaf than a salad. Cooked quinoa is accented by the subtle yet distinct flavors of lemon and fresh cilantro, making a simple yet flavorful side dish. A simple yet delicious side dish of quinoa cooked in broth, with carrots, red pepper, celery, and scallions. This versatile quinoa pilaf will work with almost anything. Here's another simple quinoa salad featuring broccoli florets, scallions, and chopped tomatoes. Bring this salad to a potluck, or pack some for lunch on the go. This super-nutritious quinoa and edamame salad is low in saturated fat. and can be used as a vegetarian main dish salad or as a great side dish for lean grilled chicken, fish or tofu. It also happens to be gluten-free, though always check the list of ingredients in broths and any other seasonings you choose to use.